Protect Your Craft from Accidental Damage! 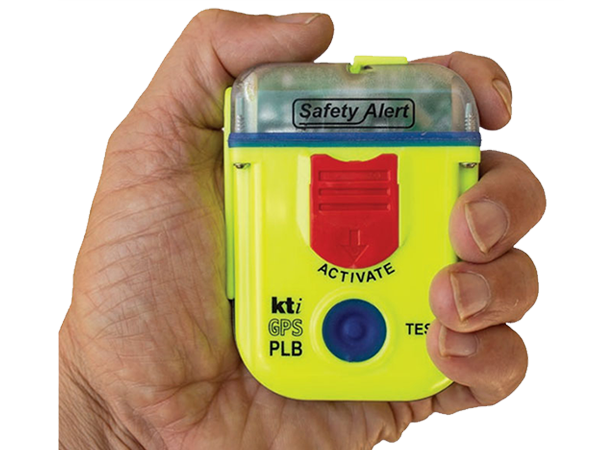 Be Seen – Be Safe! 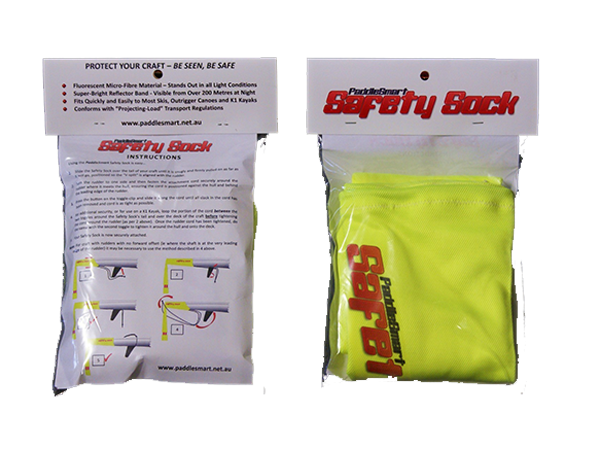 It doesn’t just extend from the end of your craft, – it also encapsulates the stern in fluorescent, high-vis, UV-stabilised fabric, ensuring the back of your craft is visible from all angles. Unlike some flags, the Safety Sock doesn’t just hang from the rudder. Flags that hang directly from the rudder leave up to a metre (and sometimes more!) of your craft effectively “invisible” during transport on a vehicle. Because of this, they do not comply with transport regulations for “projecting loads”. The Safety Sock on the other hand, extends from the very end of the craft, accurately indicating its extremity. 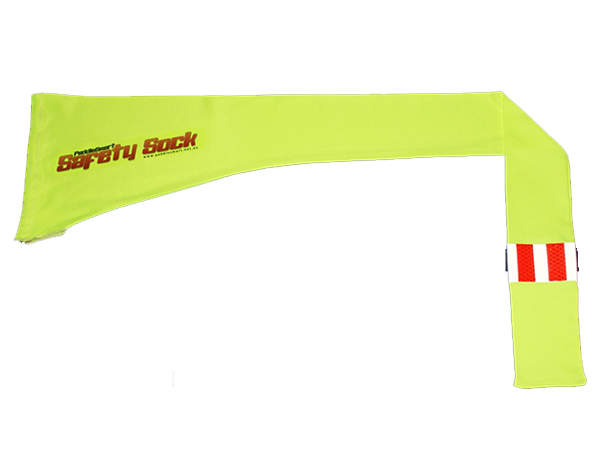 The PaddleSmart Safety Sock includes a unique retro-reflective band and four red reflectors that comply with the highest road transport standards world-wide. This reflector “system” allows the back of your craft to be seen at night from up to 200 metres away. Equipped with two fast-action toggles, the Safety Sock attaches quickly and easily to virtually any Surfski, ICF Kayak, or Outrigger Canoe. It can even be used on V1 Outriggers with the optional surface-mount deck hook. In summary, the Safety Sock is the best tail flag money can buy and your cheapest insurance against accidental damage, fines, or even litigation. 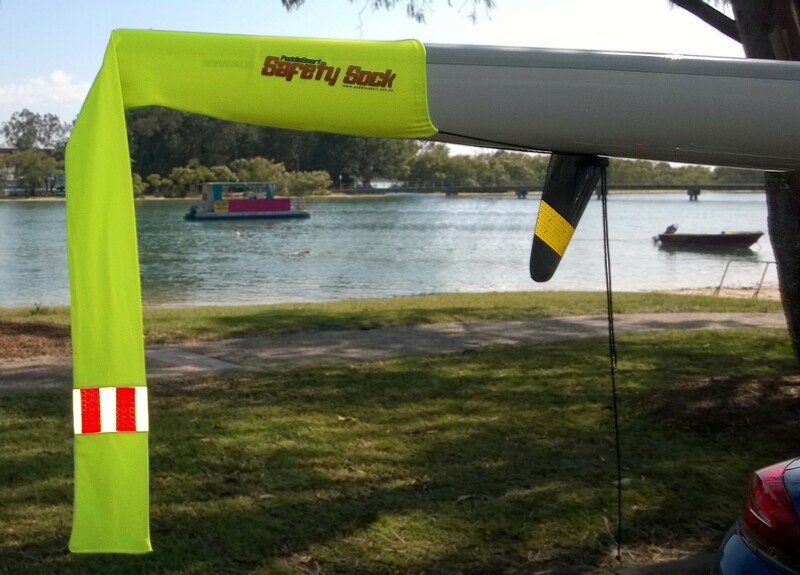 Be safe – be seen, with a PaddleSmart Safety Sock! We have a range of Stellar Skis available for demo paddles so you can be sure you are getting the right ski for your needs and ability. Transport Your Craft – SAFELY!